I regret crafting this one now... 1600 dust banished into oblivion. With the release of Bonemare, this card looks even worse that it already was. what's the point in this card now we have Bonemare? It's more proactive and has bigger stats... okay, who am i kidding, this card is terrible. Don Han'Cho is better for gimmicky burst combos including Leeroy Jenkins and Blessed Champion. Is there something wrong with my files, or is Cho no longer saying "Smash!" when attacking? Because he still does it in the sound file here, but when I use the Don in-game, it's just Han saying "We'll handle this.". Did they change it for some reason? 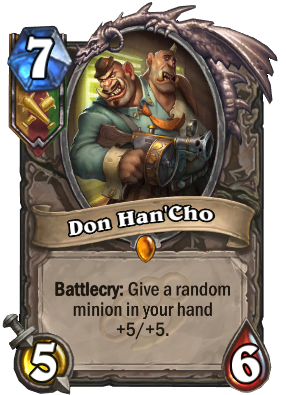 Its a bug since the tavern brawl with the 3 mean streets of Gadgetzan factions, propably a bad interaction with the Don HanCho hero and the DonHan Cho minion. In what wasn't my brightest moment, I coined this idea for a Brann, Don Han'Cho, Bluegill, Blessed Champion, OTK deck. So I decided to craft Don in order to make this deck. After a couple hours trying to make it work, my conclusion is that is just does not work. And it will never work. Don't be like me. Don't try it. I love love LOVE this card! no regrets crafting it and disenchanting Patch the Pirate.